Can you identify this Serbian street food? 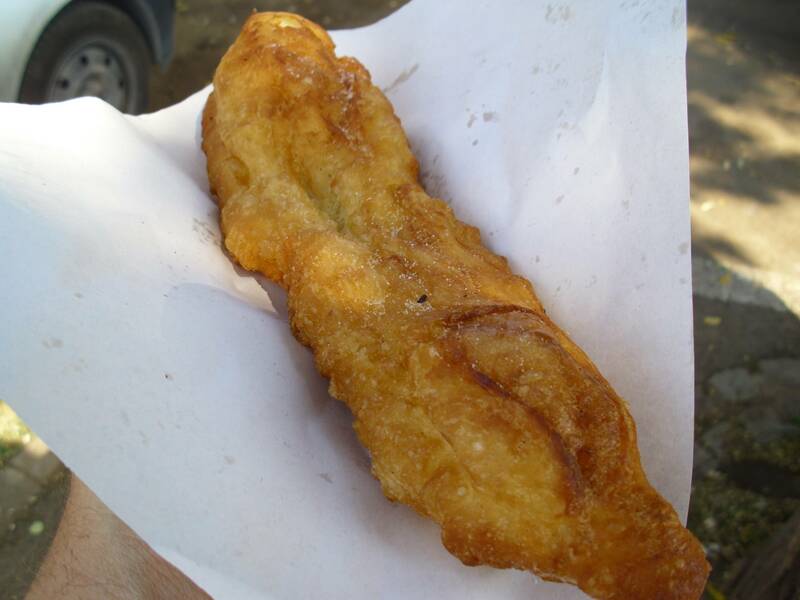 It looked and tasted like deep fried batter, how fish from a fish and chip shop might look in Australia where I'm from. It had no filling and I was offered a choice of sugar or salt. It was very inexpensive, maybe 25 Eurocents. I'm interested in its Serbian name but also if it's more widespread I'm also interested in what it's called elsewhere, variants etc. And of course what it is made of: dough? batter? wheat? That's not batter, that's yeast dough. It is called Мекица (transliteration: mekitza) in Bulgarian, Google Translate says the Serbian word is Колачи (transliteration: kolachi), which I find somewhat strange, as in Bulgarian, колачета is a different food. Maybe somebody can supply the correct Serbian word (or affirm that kolachi is correct). In itself, it is a very simple food. You just take normal bread dough, stretch it thin (the Bulgarian version is flat and more round, this one may have been adapted to street eating) and deep-fry it. There are two types, the evenly thick as you have it in the picture, and the one which is transparently thin in the middle with a very thick edge (the styles don't have their own names). It is usually eaten for breakfast. The simplest way to eat it is with confectioner's sugar sprinkled over it, but you can also spread jam on it or put feta pieces. I don't know about the geographical spread of мекици. Wikipedia suggests there is a Hungarian equivalent called lángos. A similar food with much wider distribution is made from a softer, almost liquid yeast dough, which, unlike simple bread dough, contains eggs and fat. The American word is doughnut, in Germany it is called Krapfen, and many European languages have a word derived from Krapfen, e.g. the Serbian крофне (krofne). Note that the shape differs (the American doughnut is a torus, the Krapfen has an almost spherical lens form, and the French beignet is square), but the dough is roughly the same. There are too many variations to list, Wikipedia has a very long list if you are interested. The Serbian term is mekika (singular) or mekike (plural). This simple food is made from yeast dough - you just deep-fry pieces of it in a pan. The size and shape depends on the person who makes them. As mentioned above, there is another, very similar dish called uštipak (pronounced as "ushtipak") . The only difference between the two that I can think of is the fact that mekike can be made with less oil, while uštipci must be deep-fried... Ah and yes, ushtipak is typically smaller than mekika. Not the answer you're looking for? Browse other questions tagged restaurant-mimicry food-identification balkan-cuisine serbian-cuisine or ask your own question. Can you identify these chiles on sale in Serbia and Macedonia? Can anyone identify this chocolate? Can anyone identify this RED GINSENG CANDY? Can someone identify this food? Can you help me identify these cookies? Can someone identify this herb? Please can someone help me identify this? Can you help me identify this garnish?